Complete Preludes & Études-Tableaux for Solo Piano. Serge Rachmaninoff. Dover Publications. 1990. ISBN 0486256960 (paperback). 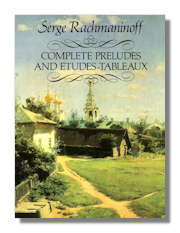 Forty-one of the Russian master's greatest works for solo piano, including the immensely popular C-sharp minor, G minor, and B minor preludes, in authoritative editions. Sonatas & Other Works for Piano. Serge Rachmaninoff. Dover Publications. 1992. ISBN 0486273075 (paperback). Sonata in D Minor, Op. 28; Sonata in B-flat Minor, Op. 36 (rev. 1931); Variations on a Theme of Chopin, Op. 22; & complete Moments Musicaux, Op. 16. 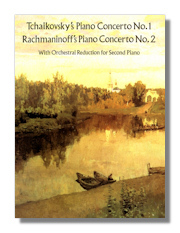 Rachmaninoff's Piano Concerto #2 & Tchaikovsky's Piano Concerto #1 with Orchestral Reduction for Second Piano. Serge Rachmaninoff, with Tchaikovsky. Dover Publications. 1996. ISBN 0486291146 (paperback). Complete Songs for Voice & Piano. Serge Rachmaninoff. Dover Publications. 1998. ISBN 0486401952 (paperback). Seventy-one songs for voice & piano. Most lyrics in Cyrillic with English translations. Piano Concertos #1, 2 & 3 in Full Score. Serge Rachmaninoff. Dover Publications. 1990. ISBN 0486263509 (paperback). Three great classics of 20th-century music in one volume, reprinted from authoritative full-score Russian editions. Lists of instruments. 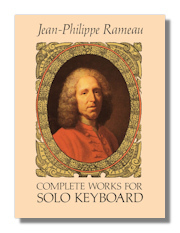 Complete Works for Solo Keyboard. Jean-Philippe Rameau. Dover Publications. 1994. ISBN 0486278476 (paperback). 63 works for keyboard. Published between 1706 & 1741 & reprinted from the Camille Saint-Saëns edition. Included are the well-known pieces, Musette en Rondeau, Tambourin, Les Niais de Sologne, Les Cyclopes, La Poule. 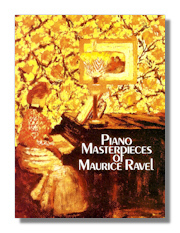 Piano Masterpieces of Maurice Ravel. Maurice Ravel. Dover Publications. 1986. ISBN 0486251373 (paperback). Contains Menuet antique, Pavane pour une infante défunte, Sonatine, Menuet sur le nom d'Haydn, Miroirs (Noctuelles, Oiseaux tristes, Une barque sur l'océan, Alborada del gracioso, La valée des cloches: Gaspard de la nuit (Ondine, Le gibet, scarbo) Jeux d'eau. Le Tombeau De Couperin & Other Works for Solo Piano. Maurice Ravel. Dover Publications. 1997. ISBN 048629806X (paperback). This volume of piano music contains unabridged versions of: Ma mère l'oye, Valse nobles et sentimentales, Le tombeau de Couperin; Suite pour piano, La Valse, A la manière de Emmanuel Chabrier, Prèlude & A la manière de Borodin (Valse). Songs, 1896-1914 for Voice & Piano. 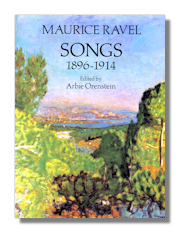 Maurice Ravel, with Arbie Orenstein (Editor). Dover Publications. 1990. ISBN 0486263541 (paperback). Reprint of Durand Edition. Included are songs and song cycles: Shéhérazade, Histoires naturelles, Trois Poèmes de Stéphane Mallarmé, Chants populaires, Cinq Mélodies populaires grecques, Saint, Epigrammes de Clément Marot, Manteau de fleurs, Noël des jouets, Sur l'herbe, Deux Mélodies Hébraiques and more. English translations of texts included. 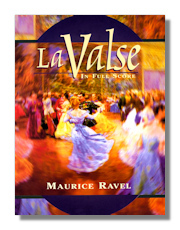 "La Valse" in Full Score. Maurice Ravel. Dover Publications. 1997. ISBN 0486295915 (paperback). Masterpiece of lush and brilliant orchestration is a work of considerable emotional depth in which the initial series of elegant waltzes are transformed into what Ravel describes as "a fantastic, fatal whirling" leading to a powerful, turbulent climax. Reproduced from authoritative Durand edition. List of Instrumentation. Includes a Glossary of French terms. Four Orchestral Works in Full Score. Maurice Ravel. Dover Publications. 1991. ISBN 0486259625 (paperback). Contents: Rapsodie Espagñole, Mother Goose Suite, Valses Nobles et Sentimentales & Pavane pour une infante défunte. 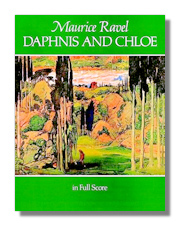 Daphnis & Chloé in Full Score. Maurice Ravel. Dover Publications. 1989. ISBN 0486258262 (paperback). Definitive full-score edition – unavailable elsewhere – of this great orchestral masterpiece. Ravel's rich musical setting of a Greek fable by Longus is reprinted here from the original French edition. L'Heure Espagñole in Full Score. Maurice Ravel. Dover Publications. 1996. ISBN 0486292894 (paperback). Light Opera in full score, reproduced from the 1911 French edition. 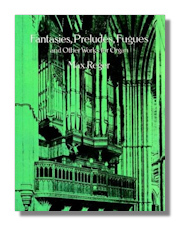 Fantasies, Preludes, Fugues & Other Works for Organ. Max Reger. Dover Publications. 1995. ISBN 0486288463 (paperback). Variation & Fugue on "God Save the King"; Fantasy & Fugue, Op. 29 and more. Reprinted from various authoritative sources. Complete Brandenburg Concertos Transcribed for Piano Four Hands. Max Reger. Dover Publications. 2000. ISBN 0486413829 (paperback). One of the major keyboard composers of the early 20th century, Max Reger made numerous piano arrangements of Bach's orchestral and chamber compositions, and these piano four-hand arrangements of the Brandenburg Concertos rank among his finest accomplishments in the genre. Not merely reductions of the orchestral scores, Reger's four-hand versions recast the original masterpieces in a truly pianistic way, creating a fascinating and satisfying addition to the piano four-hand repertoire. Reproduced from a rare edition. Serenade for Flute, Violin & Viola in G Major, Op. 141a. Max Reger. Schott/Edition Eulenburg. 1995. ISBN 3795762456 (paperback). Mozart Variations, Op. 132. Max Reger. Schott/Edition Eulenburg. 1985. ISBN 3795764807 (paperback). 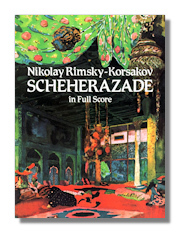 Schéhérazade in Full Score. Nikolay Rimsky-Korsakov. Dover Publications. 1984. ISBN 0486247341 (paperback). Unabridged score of great symphonic suite, masterpiece of "program" music imbued with shimmering Near Eastern moods, inventive and brilliant effects, and luxuriant melody. 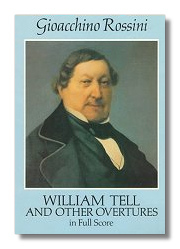 Unaltered republication of edition originally published by M.P. Belaieff in Leipzig. New English translation. Schéhérazade, Op. 35 in Miniature Score. Nikolay Rimsky-Korsakov. Dover Publications. 1999. ISBN 0486406415 (paperback). Composed in 1888 by a Russian master of orchestration and luminous tone-painting, this shimmering, evocative musical treatment of the legend of the storytelling sultana is imbued with exotic Near Eastern moods and the subtle flavor of Russian folk music. Rimsky-Korsakov's beloved symphonic composition is reproduced from the authoritative M.P. Belaieff edition. Capriccio Espagnol & Other Concert Favorites in Full Score. Nikolay Rimsky-Korsakov. Dover Publications. 1998. ISBN 0486402495 (paperback). 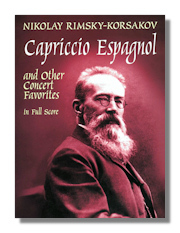 Full of atmospheric suggestion and luminous tone-painting, Rimsky-Korsakov's orchestration appears at its very best in the descriptive passages of these three concert favorites: Capriccio Espagnol, Op. 34, a lively and whimsical piece based on Spanish gypsy airs and fandangos; the Russian Easter Festival Overture, Op. 36, a celebratory composition based on liturgical themes; and "Dance of the Buffoons," a sprightly piece from the opera Snow Maiden (A Fairytale of Spring). Authoritative early scores. William Tell & Other Overtures in Full Score. Gioachino Rossini. Dover Publications. 1994. ISBN 0486281493 (paperback). Five operatic overtures: William Tell, The Thieving Magpie, the Silken Ladder, Mr. Bruschino, or the Accidental Son; Semiramide all in full score form. Barber of Seville in Full Score. Gioachino Rossini. Dover Publications. 1989. ISBN 0486260194 (paperback). One of the greatest comic operas ever written, renowned for keenly sketched characters, melodic elegance, rhythmic exhilaration, superb ensemble writing and original and delightful orchestration. Enjoy every note of Rossini's glorious score in this inexpensive edition, reproduced directly from the authoritative edition published by Ricordi. Stabat Mater in Full Score. Gioachino Rossini. Dover Publications. 1995. ISBN 0486283437 (paperback). This setting of the sorrows of the Virgin Mary at the Crucifixion is reprinted in full score form from the B. Schott edition of the revised 1841 version. (Earlier editions included four sections by another composer).